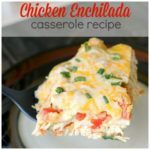 A delicious creamy chicken enchilada casserole recipe that will have the entire family excited about dinner tonight! Heat oven to 375. Prepare a 9 x 13 baking dish and begin by placing a layer of tortillas on the bottom of the dish. Then add a layer of chicken and 1/4 a cup of the shredded cheese. Add on half a can of tomatoes and green chilies and one can of the verde enchilada sauce. Finish the layer with a half a can of the refried beans. Then cover with another layer of flour tortilla pieces, and start the layering process again. Once you are finished layering, cover the top with the remaining shredded cheese. Cover with foil, and then bake in the oven for 30 minutes. Remove the foil, add a few green onion tops, and bake for an additional 5 minutes until the cheese is melted and bubbly. Allow to sit for 10-15 minutes to allow to cool before serving. Serving any sooner may give you a soupy, but still delicious dinner.